Last year acorn wreaths were really popular. They were fun and I LOVED all the colors (I think Dana painted hers 3 or 4 times) but they didn't look very acorn-ish to me. 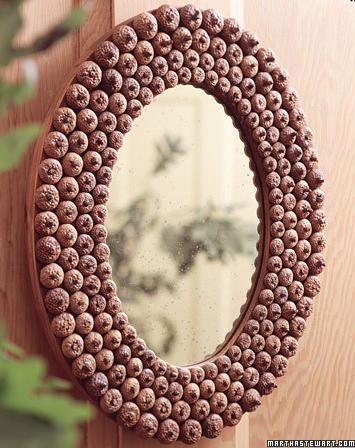 Now this miror from Martha, the acorn cap mirror, is what I think of when I think of acorns. And I think it would be a fun wreath idea too. Of course it is a lot harder to find acron caps than acorns, although I am not sure why that is. But we will be looking. You can get the tutorial for the mirror HERE.